Every July Montreal becomes the world capital of comedy as the Just for Laughs festival takes over the city. The largest comedy festival in the world spotlights hundreds of comedians at shows and revues throughout Montreal, and is a crucial step in the career of any aspiring stand-up. You don’t have to go to Montreal to experience the festival, though—they have a variety of TV programs airing on a number of different stations and websites. One of their biggest TV partners is the CW, who will be airing a 90-minute prime-time special hosted by Howie Mandel on Monday January 18. 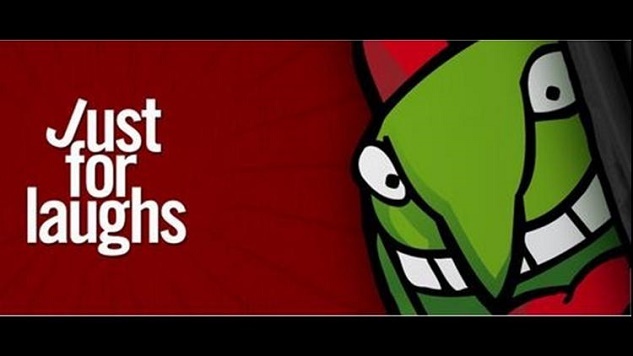 They also air Just for Laughs stand-up on their CW Seed website, which features 30 episodes of stand-up from the festival shot over more than a decade. These shows include some of the top comedians active today, sometimes before they became famous, and sometimes after they’d already established successful TV or film careers. We’ve dug through the collection and picked out five episodes worth watching, both for your own entertainment but also to get an understanding of what it feels like to go to Just for Laughs. Todd Barry is always great, of course. The highlight here though is the Schaal / Braunohler duo act, where Braunohler puts together an impromptu dating game for Schaal. Schaal and Braunohler can both veer from an almost childlike goofiness into dark territory without notice, and this extensive bit of interaction with someone who may or may not be a plant offers up ample opportunity. John Mulaney is as likable as he ever is (outside the context of sitcoms) in this set, where he talks about email hacks and ads for herbal Viagra. He bookends the episode with Jonah Ray, one of the stars of the upcoming Mystery Science Theater 3000 revival, who’s capable of doing geek-friendly material without coming off as pandering or as a fanboy. The righteous, Bill Hicks-ian fury of Simon King and Sommore, one of the Queens of Comedy, rounds out the bill in-between. Mike Birbiglia performs an excerpt from his celebrated Sleepwalk With Me show in this episode, telling the hilarious but stressful story of his struggle with sleepwalking. It’s a fine introduction to Birbiglia’s type of storytelling, which bridges the gap between stand-up and Spalding Gray-style theatrical monologues. It also features fine sets from Greg Morton and Al Pitcher. One thing I noticed during my time at Just for Laughs last year is that prettymuch every American comedian winds up doing a bit on Canada. Hari Kondabolu starts off with a Montreal joke, but quickly segues into a riff on how foreign hecklers are inadvertently more polite and less racist than American hecklers. It’s smart, funny stuff from a perspective you don’t often see on the stand-up stage. You can trace how live comedy has grown and changed over the last several years just by going to shows at Just for Laugh. The bigger shows feel like traditional, old-school stand-up revues, with a number of professional, club-hardened comedians playing large, brightly lit theaters. The comedians who do the best at these shows usually stick to broader and more time-tested material. There are also shows at any number of smaller clubs and bars throughout the city, usually with one headliner doing a full set with a single opener. That’s where you’re most likely to find “alternative” comedians, the types who are as likely to play an indie rock club as a two-drink minimum place. This older episode is from 2005, and is a good indicator of the former type of show. It features a half-dozen crowd-pleasing veterans, and feels old-fashioned in a way the other episodes on this list don’t. If you’re wondering what attending Just for Laughs in person feels like, imagine watching this show, then going to another couple of shows after it at increasingly smaller rooms, before somehow stumbling back to your hotel room with almost no memory the next morning of how you did it. And then do it again for three more days.